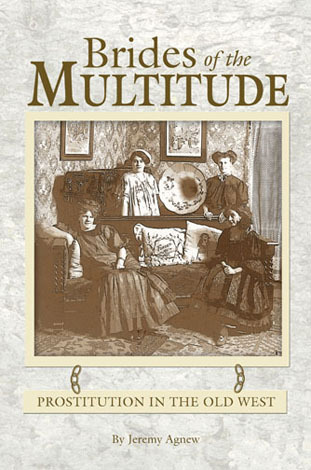 Brides of the Multitude is a fascinating, historically accurate account of why prostitution was so rampant in the Old West during the prudish Victorian era in the United States. It explains who these women were, the reasons they became prostitutes, the different types of establishments of prostitution, the conditions under which they worked, and the problems with sexually transmitted diseases and contraception. Author Jeremy Agnew points out the hard conditions under which they struggled; the difference of prostitutes in ranching, mining or other types of towns; and relates their sometimes heart-rending stories. Weaving fact and colorful anecdotes, the author has created a fascinating look at the women of untroubled virtue, who filled the red light districts all over the West. Along the way, the author busts many of the myths associated with prostitution in the Old West and points out the difference between rural and urban soiled doves, and Eastern and Western prostitutes; as well as the social order of the different types of the Brides of the Multitude. In frank, but not graphic terms, Agnew brings to light the details of a subject that is not easy to research, but which was an integral part of ever day life in the West.